It seems like just a few short weeks ago I was looking at a garden full of small, green tomatoes. Now there are so many coming in, I can't keep up! It's a happy dilemma! My eggplant, on the other hand, have not produced very much at all. I've harvested only two smallish fruit and that's probably going to be it for the season. The same thing happened last year. Maybe I'm just not meant to grow eggplant. Shrug. 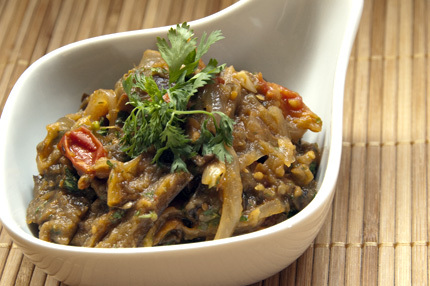 I first stumbled on this recipe for coriander eggplant in The Complete Hot and Spicy Cookbook years ago. It's a great recipe to play around with, adding more or less of whatever spices you'd like. It's also a good way to use the season's bounty. Grilling the eggplant over coals really makes this dish special, but I’ve done it many times in my oven and it’s still very good. Enjoy! Poke holes all over the eggplant then grill it over low coals until cooked through and soft. Alternatively, put it in a 350F oven for about 45 minutes. Make sure the eggplant is very soft. Traditionally the flesh is scooped out of the skin, but I like to keep the skin on (unless it’s really burnt). Your choice. In a skillet, heat about 2 tbs oil to saute the onion and ginger. When they have softened and start to brown a bit, add the coriander and cayenne and continue to cook for about 1 minute (stir constantly). Add the tomatoes and cook until they release their juices and start to break down. Add the eggplant and stir well to incorporate. Cook a little longer to evaporate off some of the liquid, stirring frequently to prevent burning. Add salt to taste. Turn off the heat and throw in the chopped cilantro. As with most Indian food, this tastes even better the served the next day. If you’re making this ahead, hold off on adding the cilantro until just before serving. It can be reheated or served cold with a side of naan bread.